Ahead of the June 23 National Convention of the ruling All Progressives Congress APC, a national leader of the party, Asiwaju Bola Ahmed Tinubu and a former interim National Chairman of the party, Chief Bisi Akande have endorsed the candidacy of former Governor of Edo state, Comrade Adams Oshiomhole for the national chairman of the party. Bola Tinubu and a former governor of Osun state, Bisi Akande, and APC Chieftain Asiwaju Bola Tinubu “My presence here symbolizes solidarity and unity of purpose to continue to build a progressive party that will carry Nigeria in a progressive manner; good governance, with courage and commitment”, he said. 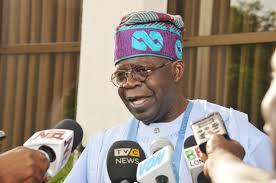 On endorsement of Oshiomhole, Tinubu said “There is no doubt, I work with him. Why should I have any doubts?” He said his reconciliation committee was still on track, saying; “We are reconciling. Being here is part of reconciliation. What is politics if it is not about conflicts, conflict of interests and conflict resolution?” The endorsements came as 24 governors elected on the platform of the party also threw their weight behind the chairmanship bid of a former Governor of Edo state, Comrade Adams Oshiomhole. Speaking when some of them paid a courtesy call on Mr Oshiomhole at his Campaign Office in Abuja, Governor of Kebbi state, Atiku Bagudu said the former labour leader as garnered a lot of experiences over the years that would enable him enhance the fortunes of the party. Among governors who visited Oshiomhole were Atiku Bagudu, Kebbi, Yahaya Bello, Kogi, Ibikunle Amosun, Ogun, Abdullahi Ganduje, Kano, Umar Tanko al-Makura, Nasarawa, Rotimi Akeredolu, Ondo and Simon Lalong, Plateau. “I believe all of us are in support of Oshiomhole. All of us. All our colleagues are happy with this development. Our party is looking forward to the chairmanship of Comrade Adams Aliyu Oshiomhole. He has had experiences in various aspects of national life and we are all confident that the party is a structure that is necessary for the continuous evolution and maintenance of democracy and his collective experiences in the recent past as the Governor of Edo state, one of the most successful leaders of trade union movement and a democratic activist all his life; these qualities would be brought to bear in achieving the ideals of the APC. So, we believe he will be a leader who will be the embodiment of the spirit of the party and the experiences will help him make the party central to governance. “I am not the chairman of the Progressive Governors Forum but I can tell you Adams Oshiomhole is my candidate for the chairmanship of the APC and is also the candidate of all the other governors. We believe that we have identified somebody who can do the job and it will be a good start and a good spirit to demonstrate by coming together and supporting the person who I believe is best fit for the job”. Speaking, Amosun said the governors were at the Campaign Office to identify with Mr Oshiomhole. He said; “We have come to solidarize with our brother. Do not forget that he used to be one of us and he is still one of us. That is why we have come to identify with him and very soon, we would be going into our convention and you know he is running for the office of the national chairman and this is the campaign office, so we have come to identify with him. “I am not the Chairman of the Governors Forum and so to that extent, I shouldn’t be seen to be speaking for the governors but let us just say that I know for me and for us in Ogun state, we are supporting him and I know that most of us (governors) are in support”. On his part, Ganduje who recalled that Kano has the largest number of delegates to the national convention, said numerically, Mr Oshiomhole had won the seat before the contest. “Kano has the largest number of delegates to the national convention and by seeing me here, it means that all the votes from Kano state will go to our candidate, the former Governor of Edo state. So, in effect, it seems that numerically, he is winning the election, before the convention”, he stated. Also speaking, Akeredolu said their was practically no contest because the election ad been won. “Speaking for Ondo state, it is so clear even to a blind person that we do not really have a contest for the office of the national chairman and as it is, when we come in full force, you will see where our votes would go if there is ever a contest. So, we are here to savour the office of the incoming chairman of our party.